O'Sheas Bar at the Commodore Hotel serves locally sourced produce at value for money prices to our customers and hotel guests. Enjoy succulent starters, mouthwatering maincourses and delicious desserts from 12.30pm daily. Our locally caught fish is a firm favourite with all our customers. Sides include home-cut chips golden fried to perfection. Should you have any dietary requirements then we would be delighted to accommodate you as best we can. We have gluten free breads, soups and dishes available. Please identify in advance if there are dietary requirements that need to be satisfied to avoid waiting times. If you would like to make a reservation then please contact us on 021 4811277. 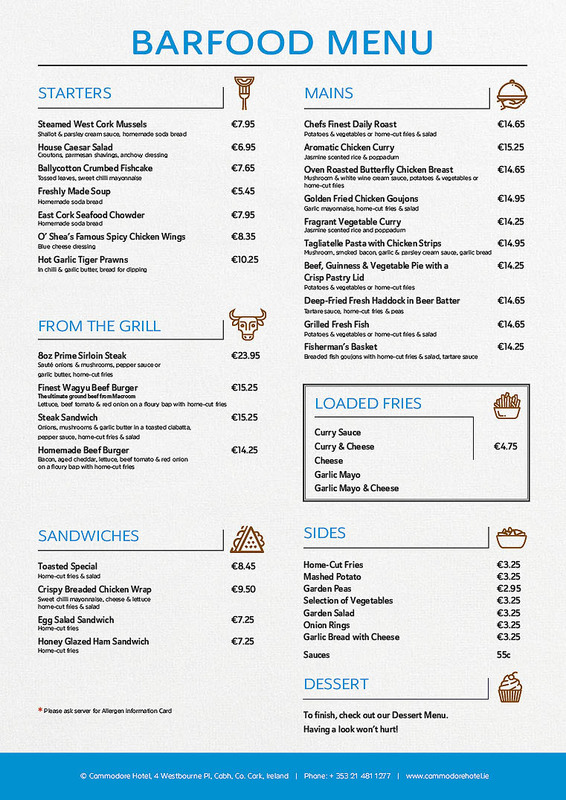 Our current barfood menu is available for online viewing. Click here to view.